Book a Prestwick Airport hotel with UKACP today. Ensure your trip is convenient, enjoyable and stress-free. Above all believe us that we can save you 15 to 60% every time by comparing and pre booking. Finding the perfect hotel has never been this easy! Pop your details into the search box and we will do all of the hard work for you. We will show you all of the suitable Prestwick Airport hotels, whilst giving you the option of booking a Prestwick Airport hotel with parking if need be. You can order the results based on what is most important to you – whether it’s price, facilities or something else. All hotels are presented with a small summary featuring the most vital details – such as transfers and check-in times. You can click for more info and even watch videos in some instances. Found a hotel you like? Great news, you can either book it now or enter your detail in the ‘Email me this quote…’ box and we will do exactly that. Manor Park Hotel has everything you could want from an airport hotel and more. It is conveniently located, the staff go the extra mile to ensure your stay is a comfortable one and the setting itself is beautiful. 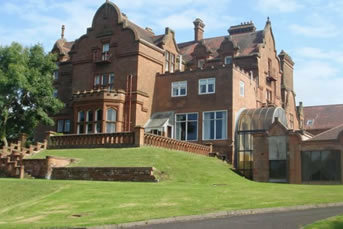 The hotel is a 19th century manor house in Scotland’s west coast countryside – so you know you are in for a real treat. It is actually only located 0.7 miles from the airport. If you are flying before breakfast, which starts at 6.00 am, you can actually arrange a packed breakfast the night before. Breakfast is also free! There are lots of great family hotels located near Prestwick Airport. The Holiday Inn Express Hotel is one of these. The rooms are modern and comfortable. They are equipped with satellite TV with pay-per-view movies, meaning you can easily keep the kids occupied for a few hours. There is also a free continental breakfast and Wi-Fi access and if you have really fussy eaters with you there's Pizza Hut and KFC five minutes away and Frankie & Benny's is right outside across the road. Some of the closest establishments to Prestwick Airport include Prestwick Guest House, Prestwick Old Course, Golf View Guest House, North Beach and Firhill. Most of these are B&Bs. If you would like to stay in a larger venue, the Adamton Country House is about ten minutes from the airport. You will need to book a taxi, which will cost roughly £8. The thing which makes this hotel really helpful is the excellent staff and its location, you're only 20 minutes from the centre of Glasgow if you fancy a look round or need to buy something for your holiday. For disabled guests the Manor Park Hotel has ground floor rooms. Don't forget that if you decide not to stay in a hotel the night before you fly you can still save money on our Prestwick airport parking packages. We will always save you anything from 15 to 60% compared to the car park gate price.